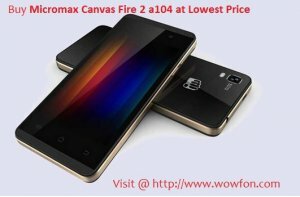 Buy Micromax Fire 2 a104 online at competitive price in India at wowfon. Check features, specification, price at our website. Micromax Fire 2 a104 is the latest smartphone in current market. It incorporates latest operating system and powered by 1.3GHz processor along with 1GB RAM and 5 MP rear camera. •Buy at very lowest price. • Warranty - up to 1 year. •Box accessories warranty - up to 6 month. •Free delivery no extra charge.